The type of home care Harrisburg seniors can benefit from may include a variety of mentally stimulating activities, which are especially essential for those who have dementia. To help your loved one better manage the condition and boost cognitive function, encourage him or her to try one of these hobbies. Seniors with dementia often have a hard time remembering people and places. However, photos, letters from family and friends, cards, and drawings from grandchildren can all help seniors recall the past, and making an album for these items gives your loved one a creative outlet to help stimulate such memories. Regularly identifying things and people can help your loved one stay connected to both the past and the present by remembering a job, former hobby, or his or her role in someone’s life. Art therapy has been shown to have a significant impact on seniors with dementia. Coloring a picture, for instance, can ignite the creative portion of your loved one’s brain and arouse curiosity by stimulating the neurons required for remembering. Drawing original pictures may jog your loved one’s memory of a person or event and help express what he or she is thinking and feeling inside. Playing Rummy or Old Maid gives your loved one the opportunity to hold something in his or her hands and feel in control of the situation. Card playing also rebuilds thinking and problem-solving skills, and there is little chance of frustration developing because your loved one only has to focus on these games for a short period of time. Studies have shown those in the later stages of dementia may be able to read if materials are presented in an understandable format, including elements like large print or colorful pictures. Reading may help your loved one recall a feeling or emotion. If your loved one is unable to read, reading aloud to him or her could place pictures and thoughts into his or her mind. Seniors receiving dementia care in Harrisburg often respond favorably to music because the brain retains musical memory after other memories have faded. When the left side of the brain is activated, singing songs may bring back your loved one’s memories of childhood or a first love as the lyrics to the songs are retrieved. Playing a percussion instrument can also stimulate your loved one’s auditory nerves, resulting in a mood-enhancing and relaxing effect. 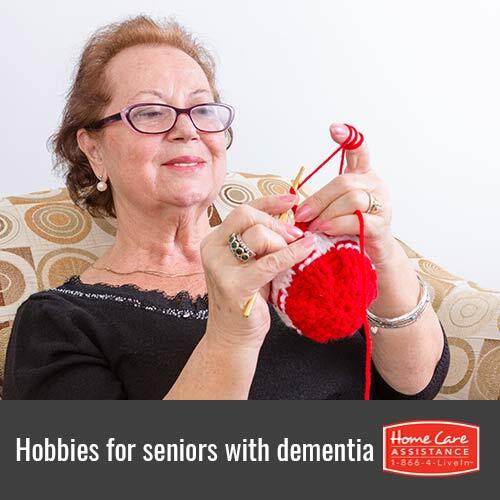 Many hobbies can be beneficial if your loved one has a memory-related condition, but he or she may yield even better results with the help of a dementia or Alzheimer’s caregiver in Harrisburg. At Home Care Assistance, all of our caregivers are trained in the revolutionary Cognitive Therapeutics Method, an activities-based program designed to delay the onset of dementia. For more information on how these and other activities can boost your loved one’s brain, call one of our qualified Care Managers at (717) 540-4663 to schedule a free in-home consultation. How Can a Senior Benefit from Online Dating?